I loved to draw as a child, and creating sketches of “the perfect outfit” was a frequent theme of mine. When it was time to get my first job, I initially chose a path in retail, which led me to co-manage a boutique in a lovely coastal town for a number of years. No matter whether I was helping a customer on a budget sift through the sale rack at the mall, or catering to a client who had the money to buy any dress in the store, I consistently encountered many customers who were in a near panic over what to wear to a wedding. This blog was created with idea of trying to virtually provide the service I used to provide in a retail environment, and combining it with the fun I have with designing these style boards , and finding new products that might interest my readers. 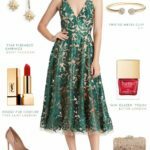 Having been a bride 3 years ago, and a bridesmaid and guest many times, I bring these three views to the site, and can sympathize with the hunt for the perfect dress and accessories in each role. 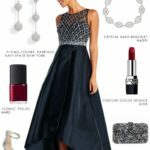 Sometimes all you need is a little inspiration, so I hope you find it here, and that this blog helps you solve the challenge of what to wear to a wedding. 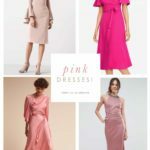 Dress For The Wedding is a unique wedding styling site dedicated to helping wedding guests, brides, and bridesmaids find inspiration for the perfect dress to wear to a wedding. We present these suggestions in a visual format as a complete outfit that is perfectly suited to the day. We are partly a wedding inspiration and styling blog, with a little bit of etiquette and advice and personalized shopping thrown in. 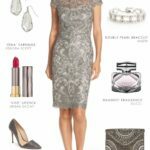 Dress For The Wedding is one of the few wedding-related sites to direct to a large amount of its content to the wedding guest, and one that attempts the solve the common dilemma of finding something to wear to a wedding. 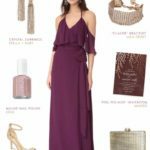 Using many sources as the foundation for our inspiration, we pull together collections with suggested outfits, specifically chosen for the type of event, complete with accessories. Every collection or set is linked to the online source where these products can be purchased. 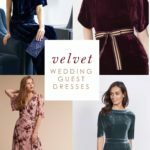 Except where noted, all of the sets and vignettes you’ll see are created exclusively by the editors of Dress For The Wedding, and reflect our personal recommendations for what to wear. As such, we view the overall design of the collected vignettes, and our corresponding copy as our unique content, and ask that you credit our site when sharing. To create these some of these sets, we use the set building tools available at Polyvore.com, and we subscribe to the Polyvore terms of service outlined on their site for use of their sets in blogs. We encourage our avid readers to read these terms, and to follow our sets on Polyvore, for we will post additional content and ideas there.